Dorothy Brett, the third of the four children of Reginald Baliol Brett (1852–1930) and Eleanor Frances Weston (c.1862–1940), was born on 10 November 1883 at 2 Tilney Street, Mayfair. Her father was Liberal MP for Penryn and Falmouth and succeeded as Viscount Esher in 1899. According to her biographer, Sarah MacDougall: "His role as unofficial adviser to the royal court dominated her childhood, and she attended dancing classes with Queen Victoria's grandchildren. In 1902 complications from an operation for appendicitis left her battling with increasing deafness." In 1910 she entered the Slade School. At the time fellow students included Dora Carrington, C.R.W. Nevinson, Mark Gertler, Stanley Spencer, John Currie, Maxwell Gordon Lightfoot, Paul Nash, John Nash, David Bomberg, Isaac Rosenberg, Edward Wadsworth, Adrian Allinson and Rudolph Ihlee. One of their tutors, Henry Tonks, who found them too rebellious, later pondered: "What a brood I have raised." David Boyd Haycock, the author of A Crisis of Brilliance (2009) has pointed out that Brett became very close to Dora Carrington and Barbara Hiles while at the Slade School. Brett and Hiles copied Carrington when in 1911 she cut her long hair to a "short, boyish bob". They became known as the "Slade Cropheads" and "set a trend for young female art students". Dorothy Brett also became close to Mark Gertler, a working-class student from Spitalfields who was receiving financial support from the Jewish Educational Aid Society. In May 1912 she invited him to a social function in Mayfair. He borrowed an evening dress suit from a friend, but the trousers were too short. He told her: "No one need know. The upper part of me will be perfect! I shall be able to look Aristocracy straight in the face." 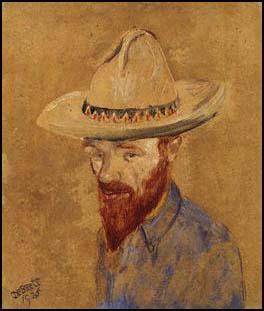 Brett won first prize for figure painting in 1914. After leaving the Slade School she exhibited with the New English Art Club. Her close friend, Dora Carrington, introduced Brett to Ottoline Morrell, who purchased paintings for the Contemporary Art Society. Morrell had promoted the careers of Augustus John, Duncan Grant, Jacob Epstein and Henry Lamb. Her biographer, Miranda Seymour has argued: "Some became her lovers; few were able to resist her combination of innocence, aristocracy, and the singularity of a true eccentric." In 1907, she began holding weekly parties at Bedford Square for the artists and writers she met and whom she hoped to help by offering introductions to rich patrons. 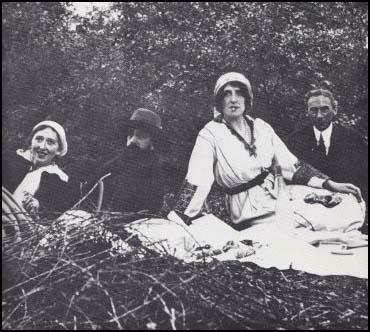 In 1916 Ottoline Morrell invited Brett to her home, Garsington Manor near Oxford. Morrell described Brett as "a slim, pretty young woman, looking much younger than she really was. She had a Joe Chamberlain nose, a peach-like complexion, rather a rabbit mouth and no chin". Ottoline provided her with a studio at Garsington, that she later shared with Mark Gertler. Another permanent guest at this time was the writer, Lytton Strachey. He complained to Barbara Hiles on 17th July 1916: "I came here with the notion of working. There are now no intervals between the weekends - the flux and the reflux is endless - and I sit quivering among a surging mesh of pugs, peacocks, pianolas, and humans - if humans they can be called - the inhabitants of Circe's cave. I am now faced not only with Carrington and Brett (more or less permanencies now) but Gertler, who is at the present moment carolling a rag-time in union with her Ladyship." Dorothy Brett met Siegfried Sassoon, Bertram Russell, D.H. Lawrence, Frieda Lawrence, Ethel Smyth, Goldsworthy Lowes Dickinson, Thomas Hardy, Vita Sackville-West, Herbert Asquith, Harold Nicolson and T.S. Eliot while she was at Garsington Manor. She also became friendly with Aldous Huxley, who portrayed her as Jenny Mullion in Crome Yellow (1921) and Beatrice Gilray in Point Counter Point (1928). During this period she became close friends with the writer Katherine Mansfield and her husband, John Middleton Murry. In 1922 Brett began an affair with Murry. She thought she was pregnant and wrote to a friend: "I am afraid I have struggled through a terrible time of depression... The worry, the fear exhausts me... I feel, as I suppose every woman feels, that the burden is all left to me. Murry can turn from one woman to another while I have to face the beastliness of an illegal operation - or the long strain of carrying a child and perhaps death - not that I mind the last - it might be the best way out if I am not strong enough to stand alone." Murry arranged an abortion for Brett but she miscarried before she had the operation. In 1924 she moved to Taos, New Mexico with D.H. Lawrence and his wife, Frieda Lawrence, in 1924, where they lived with Mabel Dodge Luhan. Lawrence used Brett as a character in several of his short stories. In return, Brett painted several portraits of Lawrence and her memoir of their relationship, Lawrence and Brett: a Friendship, was published in 1933. According to her biographer, Sarah MacDougall: "In Taos, Brett produced her most successful works, large canvases based on the life and ceremonies of the Pueblo Indians, which, alongside her friendship with Lawrence, brought her fame in her last years, but despite a small family legacy she was always impecunious.... Two of her Taos paintings are in the Tate collection; other examples of her work are in the Harry Ransom Humanities Research Center, University of Texas at Austin, and the Yale Center for British Art, New Haven, Connecticut." Dorothy Brett died from lung congestion in a hospital in Taos on 27th August 1977. Her ashes were later scattered on the Red Rocks below Mount Lobo. 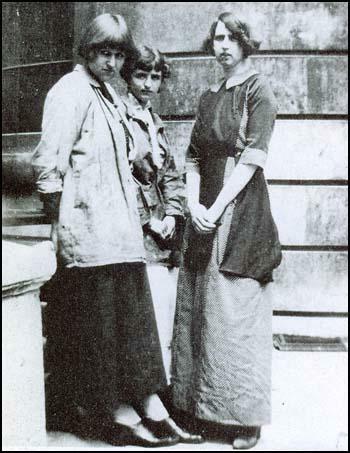 Another friend was Dorothy Brett who was nearly ten years older than Dora Carrington, but who looked the same age. She was nervous and becoming deaf, but nonetheless was extremely popular, even apparently with Professor Brown. She too remained close to her friends, but found that friendship became strained over Dora's later affection for Lytton Strachey. Deaf and lonely later on, Brett would leave England in 1924 to help D. H. and Frieda Lawrence found a new community in New Mexico.